0775 983 4652 - Stone carving by Austin Emery, LONDON. Work is to be found on many of the prestigious historic buildings in London. Work includes carving projects in the U.S. as well as in South-East Asia. The websites creator or author is Austin Emery. The web server used by Carvingstone.co.uk is located in London, Great Britain and is run by Coreix Ltd. 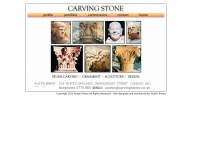 The server runs exclusively the website Carvingstone.co.uk.